The Golden Circle sightseeing route draws hundreds-of-thousands of visitors to Iceland each year with its promise of gurgling hot springs, foaming waterfalls and staggering viewpoints. But are there any extra, hidden sites and activities that can be seen and undertaken en route, and what accommodation options are recommended to easily access this essential on the Icelandic bucket list? Without a doubt, The Golden Circle is Iceland’s most popular tourist trail, comprised of three major and beloved attractions; Þingvellir National Park, Haukadalur geothermal valley and the plummeting waterfall, Gullfoss. The route covers a total of 300 kilometres (190 mi) and can be comfortably undertaken in six hours, with time left to appreciate the numerous other points of interest located nearby. Some guests choose to drive the Golden Circle themselves, whereas other prefer a Guided Minibus or Superjeep excursion; some even opt for a private and luxurious helicopter ride, providing an unforgettable birds’ eye view of the sites. Open to undertake in both summer and winter, the Golden Circle is favoured not only for the serene and unique beauty of its attractions but also because of its close proximity to Iceland’s picturesque capital city, Reykjavík. Because of this locality, the capital makes for an excellent base from which to undertake the Golden Circle, but we will learn more about later in the article. First, just what is it that makes the Golden Circle attractions so worthy of a visit? Most participants will visit Þingvellir first unless they happen to be arriving from the north after a long week circumnavigating the island. Translating to “Fields of Parliament”, Þingvellir is a national park and UNESCO World Heritage site located approximately 48 kilometres (30 mi) from Reykjavík. Characterised by its moss-blanketed volcanic fields, sweeping panoramic views and the glittering lake Þingvallavatn, Þingvellir National Park holds an important place in Icelandic culture and history. Þingvellir is where the world’s oldest active parliament, the Alþingi, first came into existence in 930 AD, with large congregations occurring amongst the rocky crevasses to hear the latest proclamations and legislation. Seventy years later, it would also be where the lawspeaker, Þorgeir Þorkelsson, chose to convert the Icelandic people en masse from Norse Paganism to Christianity, a decision that would go on to sculpt the culture and politics of the country evermore. 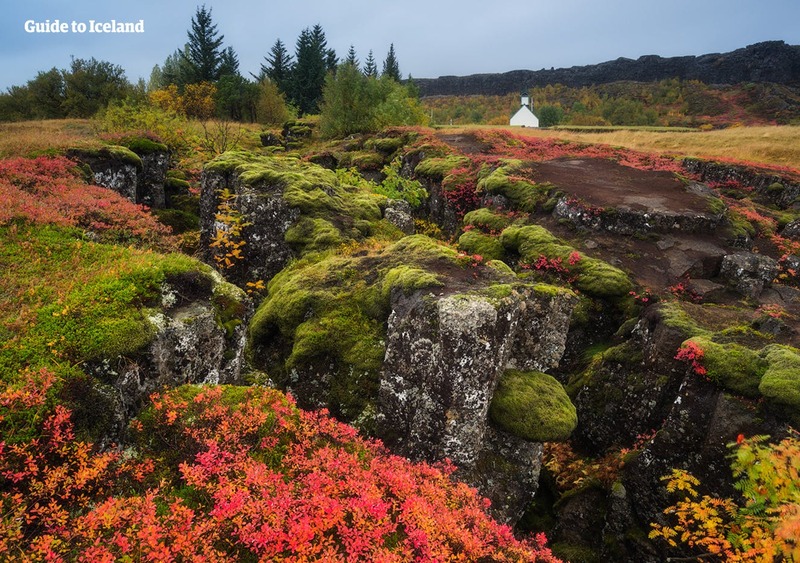 Þingvellir is also home to Iceland’s number one snorkelling and scuba diving site, the glacial spring Silfra Fissure, making it a popular spot for thrill-seekers and adventurers. Silfra is famed for its incredible visibility, often exceeding 100 metres (330 ft), as well as its haunting and dramatic underwater scenery and, to put it bluntly, its rather challenging temperature. Those looking to try their hand at snorkelling in Silfra Fissure will find an availability of tours here. Photo from Diving Silfra & Lava Caving Combo. Participants who take the plunge will be thermally protected by a thick drysuit, warm undersuit and neoprene hoods and gloves, as well as provided with a mask, snorkel and fins to complete the kit. Once in the water, guests will be privy to a dark, yet hypnotising canyon, as well as have the unique opportunity to “swim between the continents”, bringing us to another of Þingvellir’s many fascinating facets—the tectonic plates! 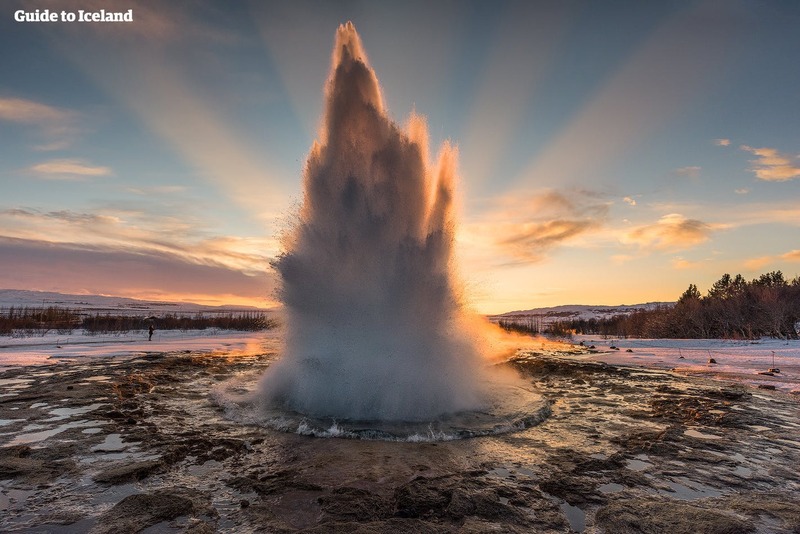 The next stop on the Golden Circle is Haukadalur Geothermal Valley, home to the widely-photographed hot springs, Strokkur and Geysir. Geysir is most famous for lending its name to geysers around the world but is in fact no longer active. Strokkur, on the other hand, erupts every five to ten minutes, shooting jets of water as high as twenty metres into the air. Aside from its two most prominent features, over forty steaming fumaroles and bubbling mud cauldrons can also be located at the site. Only 10 kilometres (6 mi) away from Haukadalur, one can find this rustic farmstead boasting four bedrooms able to sleep eight people. With two floors and a 150 square meters of space, this rental makes for a great choice for those looking to spend a long time in a region famed for its fresh produce, rolling farmlands and abundance of the iconic Icelandic horse. The third and final stop of the route, Gullfoss waterfall, can be located a mere 10 minutes drive away, making accommodations between the two a prime option when it comes to easily accessing the sites. Gullfoss drops a total of 32 metres (105 feet) over two cragged steps, cascading into the ominous Gullfossgjúfur canyon below. 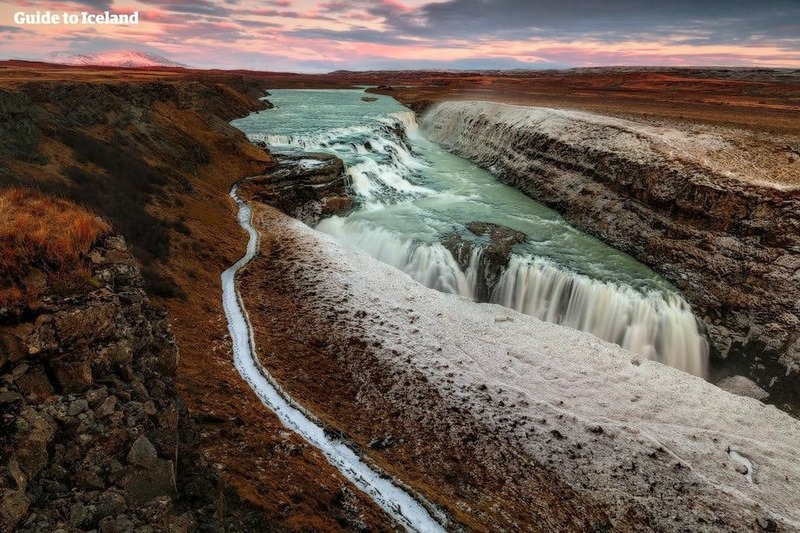 The water of Gullfoss travels down the Hvítá river, originating from the creeping ice cap, Langjökull, making the site one of the best locations to see Iceland’s fascinating water cycle firsthand. As fate would have it, Gullfoss is also where Iceland’s very first environmental movement was born. In 1912, a British businessman named Howells proposed to purchase Gullfoss, then privately owned, in the hope of utilising its mighty power for a hydroelectric plant. This plan was severely opposed by the landowners’ daughter, Sigríður Tómasdóttir, who would routinely walk miles to Reykjavík in order to have her day in court. At one point, she even threatened to throw herself over the lip of Gullfoss should it be sold for corporate purposes. Thankfully, Howells deferred on rental payments, and the land returned to its original owner. In the seventies, the waterfall was sold to the Icelandic government and is now a protected site. Examples of accommodation found between both Gullfoss and Haukadalur include Helludalur Cottage, located at the base of Bjarnarfell Mountain and boasting three bedrooms (able to accommodate 8 people), a comfortable living space and fantastic terrace, complete with scenic views. Another excellent choice would be this comfortable cottage, only ten minutes walk from Haukadalur. Sleeping up to six people, this two-bedroom property includes such useful amenities as wifi, BBQ terrace and laundry utilities. Another example of the extra activities that can be undertaken on the Golden tour includes snowmobiling on Langjökull glacier, an excursion that often utilises Gullfoss car park as its departure point. Snowmobiling in Iceland is one of the most memorable, exhilarating and easily accessed activities available, offering not only a healthy shot of adrenaline but also a deeper insight into the glacial giants that cover over 11% of the country’s total landmass. Extra attractions on the Golden Circle include the likes of Kerið volcanic crater, the farm and ice-cream parlour, Efstidalur, and the steamy village of Flúðir, home to roughly 800 people. Whilst impressive, one should note that Kerið volcanic crater is one of the few natural sites in Iceland that requires an entrance fee (400 ISK), but does provide a rounded appreciation of the violent means in which this country came to form. Photo fromMinibus tour of the Golden Circle | The Classic Sites and Kerid Crater. Holiday cottages at Flúðir make for an excellent base from which to see all of the sites listed above.and Such charming properties as the three-bedroom, Jatoba wood-built Álfaheiði Summerhouse, or alternatively the two-bedroom summerhouse, Ásabyggð, are both fantastic examples of the rental options that can be located in the area. Another popular bathing area, though a slight detour, is Fontana Geothermal Baths, located in the town of Laugarvatn. Laugarvatn itself is found on the stretch between Þingvellir National Park and Haukadalur, and is wildly underrepresented as a point of interest. Stopping is sure to provide you with one of your more sensual and relaxing memories in Iceland. Locals of the area having been utilising nearby hot springs since the early 1920s, but Fontana was built in 2011 as a contemporary spa to provide this experience to Iceland’s international guests. Those wishing to stay in Laugarvatn have a number of cottage options, one such being this unique and postmodern home, only twenty minutes from the national park, and with such amenities as three bedrooms, hot tub and balcony. 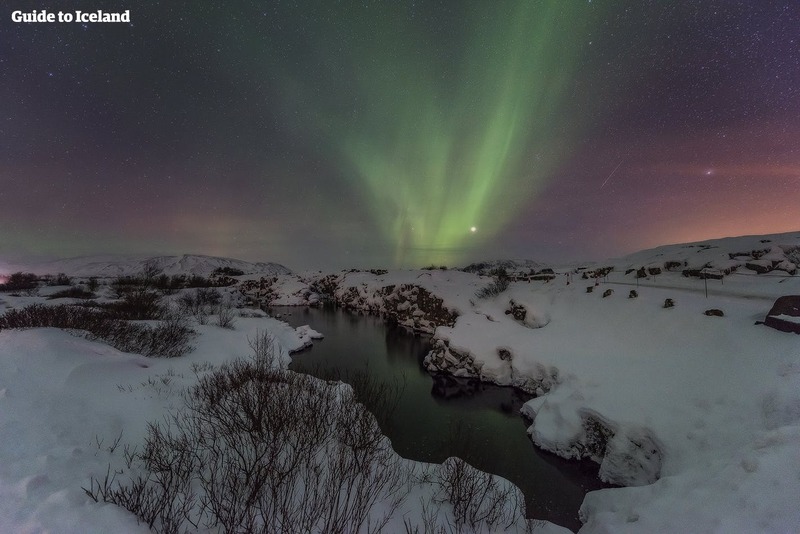 As aforementioned, the Golden Circle begins only forty minutes drive from the capital Reykjavík, meaning the city is perhaps the best option for getting an all-round taste of Iceland, sightseeing included. Of course, there is plenty of choice for lodgings in the city, but those hoping to maintain their attachment to nature could try such properties as the Blueberry Hills Villa, surrounded by the purple lupin flower, or the luxury wooden home Heytjörn, itself placed between Esjan and Bláfjöll mountains. Wherever you use to stay to partake in the Golden Circle, there’s no doubt you’re destined to experience one of Iceland’s most memorable sightseeing routes. As a precaution, please make sure to always check the weather conditions if driving yourself, and make sure to let others know of your plans. Naturally, your choice of accommodation reflects the holiday experience you are looking for, but know that both nature-lovers and urbanites will find a property that more than meets their expectations. Thanks for Reading till the end!